Being someone who has quite spot prone and oily skin I’ve tried a variety of ways to cover up what I can. Not everyone likes to do heavy duty covering up but I’m quite conscious about my spots so I prefer to do so. First of all I will use my Rimmel Wake Me Up Concealer in the shade Ivory to cover up my dark circles, across my nose and then dot it on any blemishes I have. Because this is a liquid based concealer, it gives a sheer coverage, but this is just what I start with. I usually use my Real Techniques Miracle Complexion Sponge to blend this in with because it gives a bit more coverage. This is possibly one of my favourite concealers it just glides on so nicely – I’ve mentioned this hundreds of times on my blog now (oops)! Secondly I use my Benefit Boi-ing Concealer in the shade 01 Light. As you can see from the picture its basically empty and I did feature this in an empties post. However I wasn’t ready to part with it and I couldn’t figure out a way to get more from it – but then I discovered the Real Techniques Pixel Point Eyeliner Brush. I never use brushes for their fit purpose, is this just me haha? Its the perfect size to get some of the concealer on then dabbing onto any blemishes or spots you may have. This concealer is pretty heavy going and hides any marks so well. I again blend this in with my RT Miracle Complexion Sponge or just my ring finger. Any spots, blemishes or redness you had will be hardly visible with this stuff! 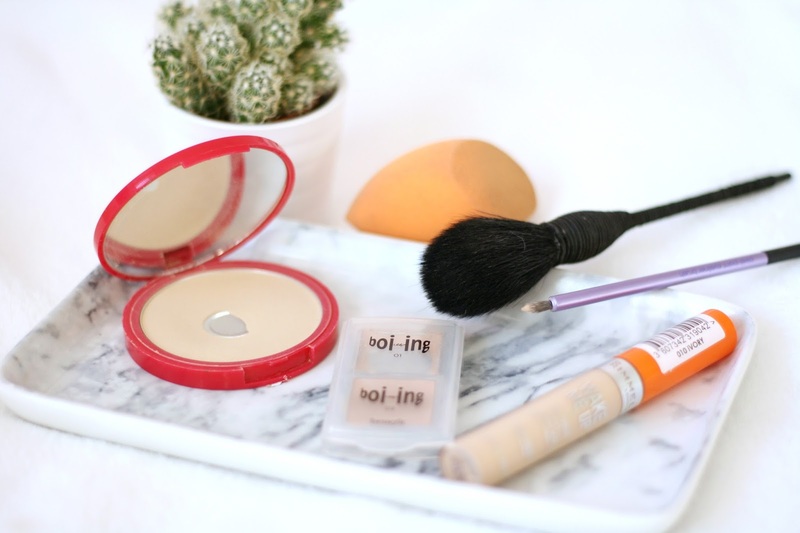 To set both the concealers in place I use my Bourjois Healthy Balance Powder – which is the best drugstore powder I have ever tried! I use my new Born Pretty Store powder brush to put this over the top of the blemishes I have concealed and you’re set to go for the day! This technique lasts me all day and keeps any blemishes well hidden. I hope this helped, however I don’t want anyone to take this the wrong way, you don’t have to cover up anything on your face – you’re beautiful with or without coverage! I just prefer to for confidence reasons. What concealers do you use to cover up blemishes?